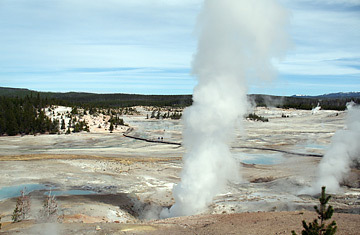 Yellowstone Park's bizarre steam vents and odiferous boiling pools are more than just tourist attractions and geological curiosities. They are home to unique microbes  living organisms that thrive in extreme heat. More than that, they are valuable resources for industries searching for fresh and big profits. Year by year, Yellowstone's hot waters are yielding remarkable new microbial specimens with implications for medicine, agriculture and energy, as well as offering clues to the formation of earliest life on Earth and maybe even on Mars. The potential financial windfalls are enormous, as evidenced by one big jackpot. In 1966, bacteriologist Thomas Brock brought back to his lab specimens of a microorganism that was thriving in 80-plus degree Celsius waters in pink algae and microbial mats of Yellowstone's Lower Geyser Basin. It was called Thermus aquaticus and Brock donated several specimens to a public repository in Washington D.C., the American Type Culture Collection, where years later Dr. Kary Mullis, a researcher from a biochemical corporation, bought a sample for $35. Mullis would win a Nobel Prize in chemistry for using Thermus aquaticus as a key component in a process used to identify and analyze the genetic fingerprints of DNA. Today, when you hear forensic investigators on CSI refer to the Taq Test, they are referring to Thermus aquaticus. Mullis' company sold the rights to his Taq-based process in 1991 to Swiss pharmaceutical giant F. Hoffmann-LaRoche for $300 million. Today, Hoffmann-LaRoche's annual sales of related licenses and equipment related to the process run to over $200 million. There are more and more discoveries. Last summer, a new species of Yellowstone bacterium was discovered that produces chlorophyll and converts light energy through photosynthesis into chemical energy. Dr. Dave Ward of the Thermal Biology Institute of Montana State University said that because of new knowledge of microbial solar-energy capture, this bacterium may have implications for alternative fuels. Scientists have also found a unique grass that thrives around Park hot springs providing fresh feed for elk and bison in winter, thanks to a root system aided symbiotically by a heat-tolerant microscopic fungus. Scientists hope that those traits might someday be applied to help crops survive drought and sun-baked soil. Yellowstone microbes (and those from a few other hot spots on the planet) may also hold great promise for bioremediation  cleaning up chemical pollution, oil slicks and smokestack emissions  as well as the means to accelerate biomass fermentation and develop drought-resistant crops. And there is more to be discovered: Probably less than one percent of Yellowstone's microscopic life forms have been discovered and studied. Yellowstone had no share in the Taq test profits. And so, hoping to cash in on its natural resources, the National Park Service signed a secretive research-sharing agreement with Diversa Corporation in 1998. Non-profit groups quickly cried "bio-piracy!" when they found out and sued the Service over the arrangement. While a federal court dismissed the case, it ordered the Park Service to address the issue  throughout all its parks  by assembling a full-blown environmental impact statement that allowed for public comment. A 340-page draft was completed last year. But the Park Service is still trying to come up with an acceptable, benefits-sharing agreement that might allow bio-prospecting of microbes and disclosure of findings, with a fair return to the Park from any commercial success. Thermus aquaticus discoverer Brock, is philosophical about the whole thing. "Yellowstone didn't get any money from it. I didn't get any money, either, and I'm not complaining. The Taq culture was provided for public research use, and it has given great benefit to mankind."